Stepping Stones has seasonal job openings at two of our Greater Cincinnati locations! Throughout the school year, our weekend recreation programs help children, teens and adults with developmental disabilities find pathways to independence that improves their lives and enables them to more fully participate in their communities. These seasonal job openings are perfect for college students looking for a weekend position. 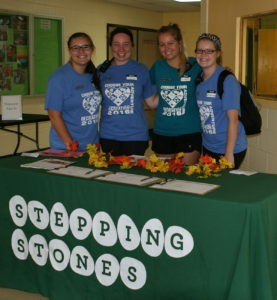 Openings are available at Stepping Stones Allyn Campus (Batavia) and Given Campus (Indian Hill). Browse seasonal jobs throughout the school year below and complete an online application, today! Build and promote positive relationships with participants. Provide personal care to participants. Lead program activities, complete paperwork and ensure the safety of participants at Stepping Stones. For a complete list of Saturday Club dates, click here. Time: Two Saturdays per month. Build and promote positive relationships with participants. Provide personal care to participants. Stay overnight in sleeping lodges with participants. Lead activities. Complete paperwork. Ensure safety of participants. Time: Two weekends per month. For a complete list of dates, click here. No one shall be denied employment, services or volunteer opportunities on the basis of race, color, ethnicity, national origin, religion, gender, disability, age or ancestry.